A brief post about some free research press (and the new addition to the Cover Gallery). 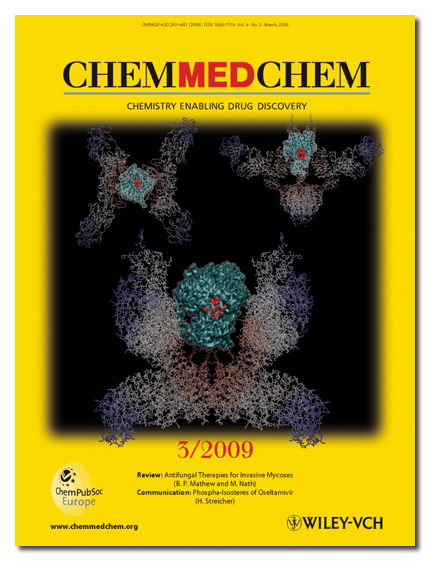 Having already been featured on the cover of the ChemMedChem March 2009 issue (see the New B12-Insulin-TCII-Insulin Receptor Cover Image For This Month’s ChemMedChem (March 2009) post) , the side-on view of the B12-Insulin/TCII/Insulin Receptor structure was chosen for this month’s cover of Clinical Chemistry. While the originating article itself is not included in the issue (I should have recommended citing the ChemMedChem article in the image caption), several diabetes-related articles are featured in this month’s issue. ON THE COVER: Scientists are investigating ways to develop effective oral insulin therapies. 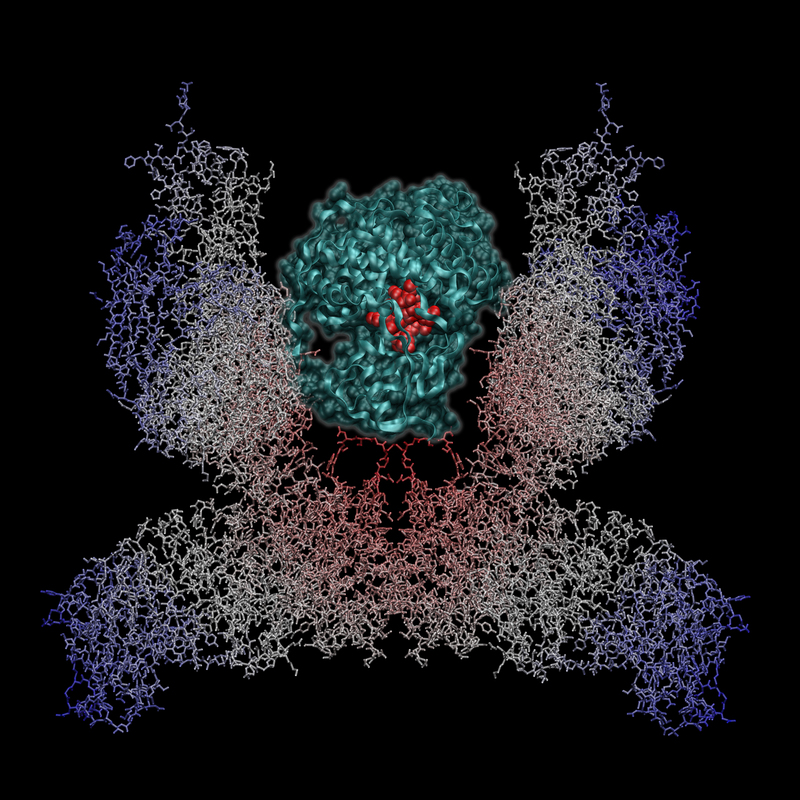 One such model is a vitamin B12-insulin conjugate bound to transcobalamin II and is shown here docked in the insulin receptor. 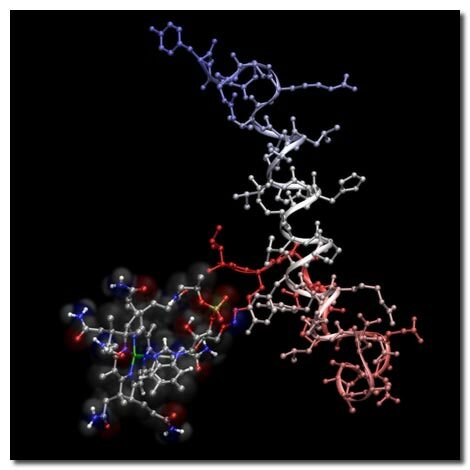 The discovery of easier ways to deliver insulin into the blood stream would improve the lives of the millions of individuals living with diabetes. This month’s issue of Clinical Chemistry contains 4 articles related to diabetes. The first 2 articles provide readers with a point/counterpoint discussion of the value of reporting estimated glucose along with Hb A1c. Next is an article on the association of apolipoprotein B with incident type 2 diabetes. Lastly, the development of the first radioimmunoassay for insulin led to a Nobel Prize and is chronicled in this month’s Citation Classic feature. (See pages 545, 547, 666, and 671.) Image reproduced with permission from Damian G. Allis and Robert P. Doyle, Department of Chemistry, Syracuse University. 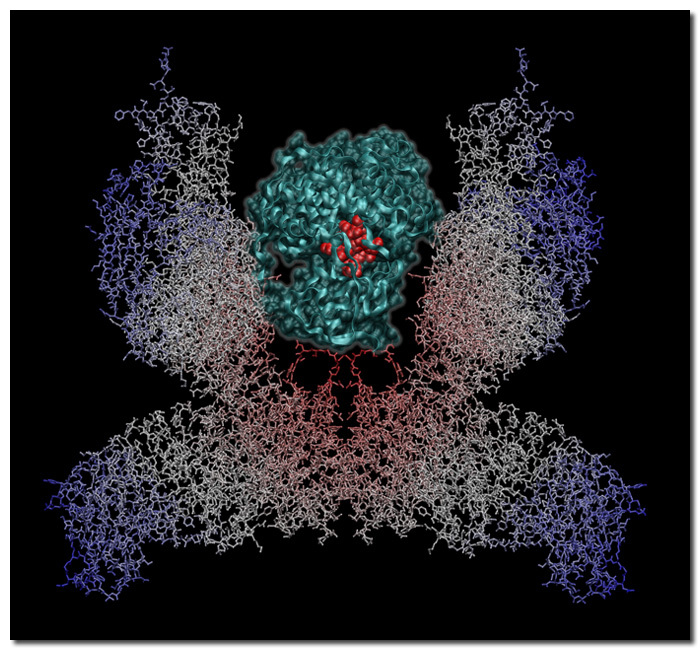 As a brief explanation of the image, this “scene” is meant to show (without proper molecular dynamics simulations to show how well it would work) that the Transcobalamin(II) transport/protection protein for cobalamin/cyanocobalamin (vitamin B12) and the B12-insulin bioconjugate discussed in the ChemMedChem article is small enough to fit within the Insulin Receptor protein such that insulin may still be able to bind to its receptor. This is the final piece of the puzzle in the proposed mechanism (and experimentally demonstrated event) by which the B12-insulin bioconjugate retains all of the benefits of free B12 (transport from the digestive system to the bloodstream) and insulin (proper receptor binding and the subsequent induction of cellular glucose uptake). 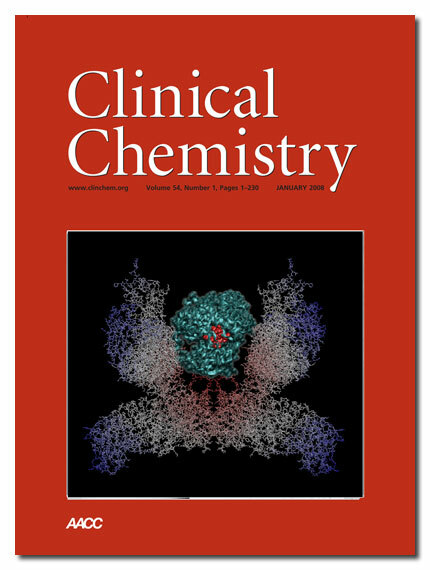 The figure caption and April 2010 Table of Contents can be found in PDF format at the Clinical Chemistry website (with a local copy of the PDF also available HERE.